LEFT shows the locality for this rare species. It is a habitat common to many shores of Lough Allen. 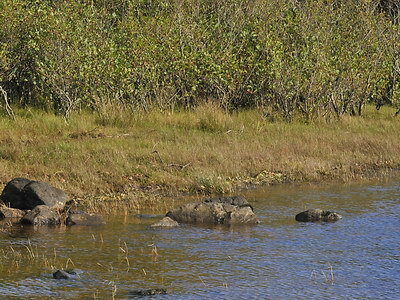 This photograph was taken in October in mild and dry weather so there is much vegetation on the shore. The Rush grows in a small area behind the rocks. The growing ‘habit’ of this plant is quite distinctive. 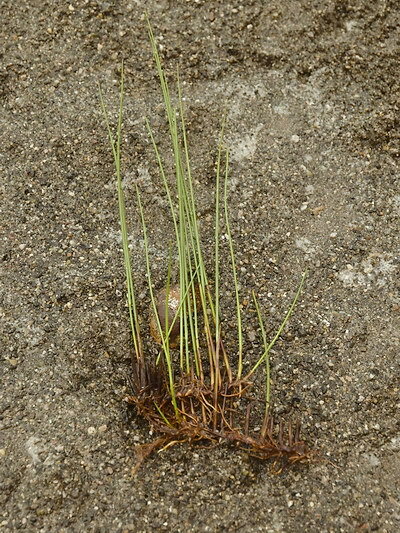 Firstly it grows largely in sand with a thin cover on it. All the stems emerge from the ground in a straight line of up to 15cm. They are emerging from a single rootstock. 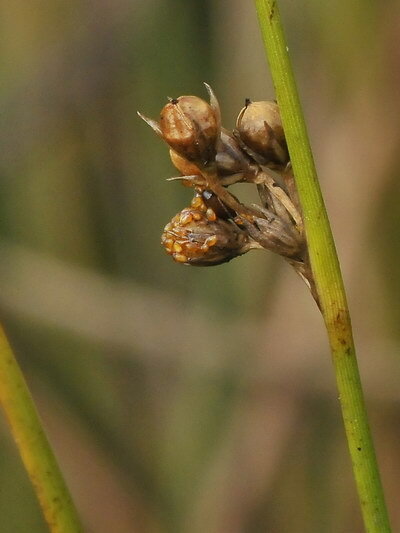 This is common to other rushes but this species does it very noticeably. 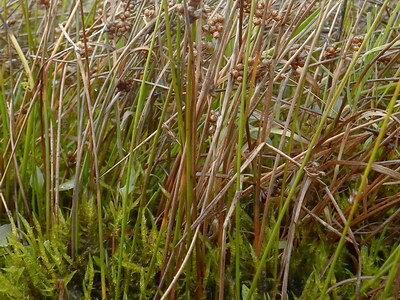 The lower part of the stem is red, then green and ridged, and then brown as the stems tend to die off above the fruiting body. 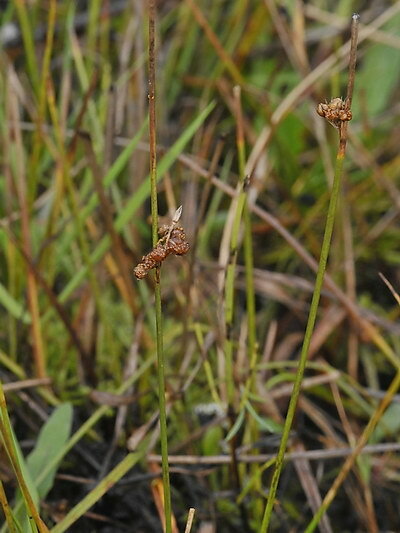 In a young plant the bright green stalk are strikingly vertical. As they get older the fall away from one another like the supports of a fan. On LEFT, at the bottom of the picture, you can see a row of at least 4 stems gently spread apart. As the heads develop in the Autumn this is obvious. In the Spring the sharp fresh rows of bright green stalks emerging from the water like they are standing to attention, make this species somewhat recognisable. It is amazing to think of this delicate species surviving in a small patch the size of an urban garden. Plus the fact that in the Winter of 2013/14 they were submerged for months. Thread Rush is widely distributed in both the New and the Old World and seems to be spreading in Britain and now occurring here. The specimen on the LEFT was found after stormy conditions in the Spring had eased and this shore was exposed again. It was hanging on by a thread! Most of the other Thread Rushes in the area were intact in a slightly clayey bank which had not been broken up. Perhaps if sections like this drifted away from the site they might root elsewhere. So far, we have looked in many such suitable habitats but strangely it has not be re-located yet! It effectively shows the detail we have shown in our photographs apart from the ribbing on the stem which is characteristic of the species. 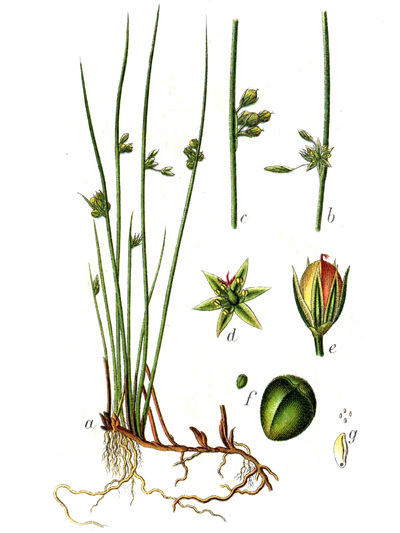 ‘a’ shows the reddish coloured roots with flowering stems arising from it in precise order. ‘d’ refers to the structure of the flower with 6 Tepals (combined petals/sepals and the remnants of a stigma withering on top of the ripening fruit. ‘e’ is a mature capsule with its little topknot holding it all together.